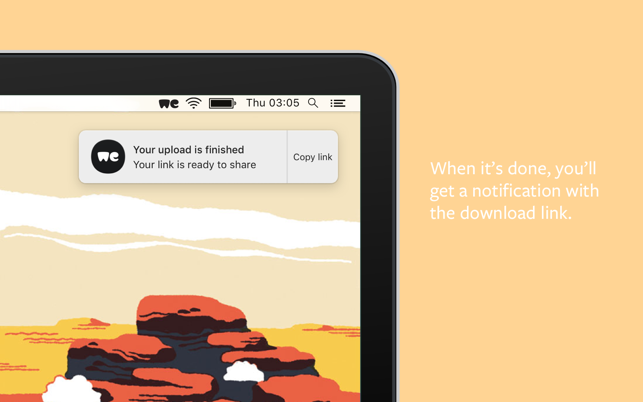 Just drag and drop to upload your files and you’ll get a download link that you can share wherever you’d like, however you’d like. It’s that simple, and it’s free. 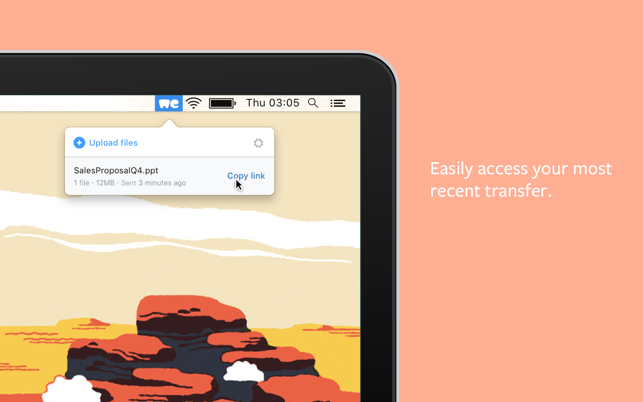 If you’re a WeTransfer Plus user, you can easily sync the app and access your account directly. We believe great things happen when everything just flows. It’s now even easier to upload folders using the Mac app. Just drag, drop and send – no zipping, archiving or compressing needed (you're welcome). I've been using the website version for years and the desktop version works just as well - with the convenience of not having to keep a browser tab open. The upload link copied automatically to my clipboard when it was done - piece of cake! I downloaded this app form appstore on my Mac but it does not open, then decided to remove the app from my computer, the message appears: you can not delete the app because it is open! On the list of open applications it is not listed therefore I cannot force quit. I am stuck with this spam junk and concerned about malware installed on my computer and risk of being hacked. Because all the app does is give you a download link, you can’t track who has downloaded the app through the Transfers page. It would be nice if there was an interface to add emails and send directly through the app.